The Quiet Comfortable 2017 Ford Fusion Energi Offers Buyers Two Ways To Save. The 2017 Ford Fusion Energi plug-in hybrid midsize car combines a comfortable, roomy, and stylish sedan with sophisticated plug-in hybrid technology to deliver extraordinary fuel economy without compromise. The combination of lithium-ion battery, electric motor, and gasoline engine in the 2017 Ford Fusion Energi plug-in hybrid vehicle provides a system of impressive efficiency and provides up to 195 horsepower when needed. As you drive, Fusion Energi determines whether it’s more efficient to operate on its electric motor alone or to start-up the 2.0L Atkinson-cycle gasoline engine for additional power. On short commutes, even at highway speeds, the Fusion Energi may run entirely on battery power. You can also make the determination as to which of three modes the Fusion Energi will operate. The Auto EV, which is the default setting, EV Now which uses mostly using plug-in power, and EV Later where plug-in power is reserved for future use. So you can choose to use electric, gasoline or a combination of both. When you apply the brakes in the Fusion Energi plug-in hybrid, the regenerative braking system recovers more than 94 percent of this energy that otherwise would have been lost and sends it to the battery for later use. The plug-in capability of the 2017 Fusion Energi means the 1.4 kWh lithium-ion battery can be fully charged in approximately seven hours using the standard 120-volt convenience charge cord provided with the car. Available 240-volt options reduce charge time to about 2.5 hours. To monitor the status of your Fusion Energi plug-in hybrid, the dual LCD SmartGauge with EcoGuide is a customizable dashboard that not only tracks your vehicle’s range and efficiency but helps you learn how to maximise the fuel savings a hybrid vehicle can provide. The Ford Fusion Energi is now available in three models, the SE, Titanium, and the new for 2017 Platinum. Each offers its own combinations of features and available options. On the exterior, the 2017 Ford Fusion Energi features a redesigned front fascia featuring a wider and more angular grille and rear fascia and lower decklid, along with three new colours, including Lightning Blue, Burgundy Velvet Metallic Tinted Clearcoat and White Gold. And on the inside, the 2017 Fusion Energi has nearly 60-percent more storage over the last year’s model, including additional storage in the console. A slimmer A-pillar improves driver visibility. The armrest is longer, along with the addition of a lighted USB port. The low-profile rotary gear shift dial was created to take up less room, opening up space for more convenient cupholders. The new for 2017 Fusion Energi Platinum edition features premium leather seat tops, leather-lined and quilted door trim panels, a leather-wrapped steering wheel, power tilt/telescoping steering column with memory, leather-covered dashboard, and LED headlamps. 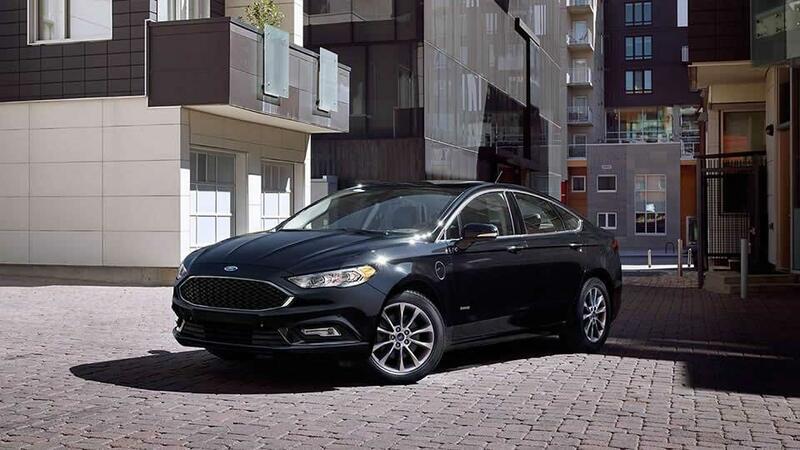 The Ford Fusion Energi offers a wide range of available technologies to help keep you aware of your surroundings and ever-changing traffic conditions. Among the several available driver-assist features include SYNC 3 with Siri EyesFree capabilities, adaptive cruise control, and Pre-Collision Assist with Pedestrian Detection. Enhanced active park assist, which now includes reverse perpendicular parking assistance to the existing parallel parking capability, is now available as well. If you’re in the market for a PHEV, there’s no better choice than the 2017 Ford Fusion Energi. It’s a quiet. Comfortable sedan with excellent highway manners with the additional benefit of the long-range provided by a hybrid-vehicle coupled with the advantages of driving on electric power alone. Come see the experts at Van Isle Ford, in Port Alberni who are specially qualified to answer any of your questions regarding the benefits of own a Fusion Energi.